Deckadance 2.43 is now available. This is a maintenence release that fixes bugs reported with the last version. 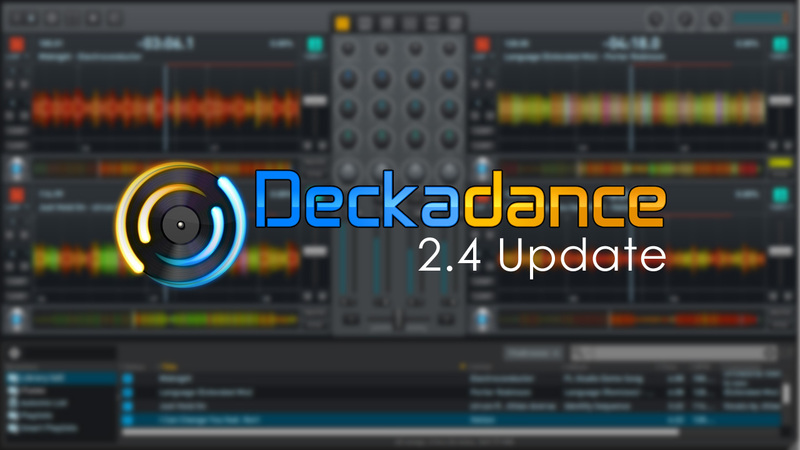 You can read more about the new features of Deckadance 2.4 here. Deckadance 2.42 adds Elastique v3 engine with improved transient processing, multi controller support (via scripting), native support for Behringer CMD 2A and Casio XW-DJ1. Elastique v3 engine with improved transient processing. Multi controller support (via scripting). Added native support for Behringer CMD 2A. Added native support for Casio XW-DJ1. Fixed iTunes library importing problem for OSX (Yosemite update). Fixed manual editing of filepaths in the song manager. Changed preferences dialog window for MIDI scripting and ILRemote areas. The following script commands are now momentary: SYNC_LOCK, SNAP, LOOP, LEAP, KEY_LOCK, FX_(HIGH/MID/LOW)_BAND_GROUP and EFFECT_ON. Image-Line Remote Support - Controller support from up to 15 Android and iOS devices. New Smart Panels - EQ, Gain & Filter, Volume, Mix & Isolator, FX and Grossbeat. Fixes bugs - Reported from Deckadance version 2.2. Added MIDI script commands - PLAY_X, PHASE_SYNC_X, BEAT_ID_X, STANDALONE and TRACK_POSITION_X. Fixed - Issues with soundcard samplerates >= 99.6 KHz. Fixed - Synchronization problem with the Leap function in Snap mode. Added - Automatic switching of MIDI ports between standard MIDI page and Scripts page. Deckadance 2.2 added MIDI scripting so you, developers and the community can now create MIDI controller scripts to control Deckadance 2 for any MIDI controller including controller feedback, where applicable. We have listed some demo videos below running controllers from the new MIDI scripts. See below the videos for how to get your controller supported with feedback. 1. Manually link your controller as completely as you can, then use the new Export Script function on the MIDI Mapping Editor. 2. Upload the script file to the Deckascripting forum where our team will do their best to help you update the feedback system (lights etc on the controller). tutorial.txt - provides small scripting tutorial. dd_commands.h - list of Deckadance commands available for scripting. Scripts use the AngelScript language that follows the widely known C / C++ syntax and data types. To use a script, select it via the MIDI Scripting tab on the Preferences. Registered customers can also participate in the Deckascript forum to share scripts and get support writing them.